Amaluna invites the audience to a mysterious island governed by goddesses and guided by the cycles of the moon. The show honours femininity, renewal, balance and the passing of these values from one generation to the next. Inspired by the natural world, Scott Pask created a mysterious and verdant island featuring a carefully crafted forest of bamboo-like branches that surround the action on stage. The stage and its turntable allowed for dynamic interaction with the audience. We designed an axial layout for the turntable’s base structure and our OST system was used for the curved and straight elements of the entire set. The turntable and its periphery traps for the performers are operated from either above or below the stage. 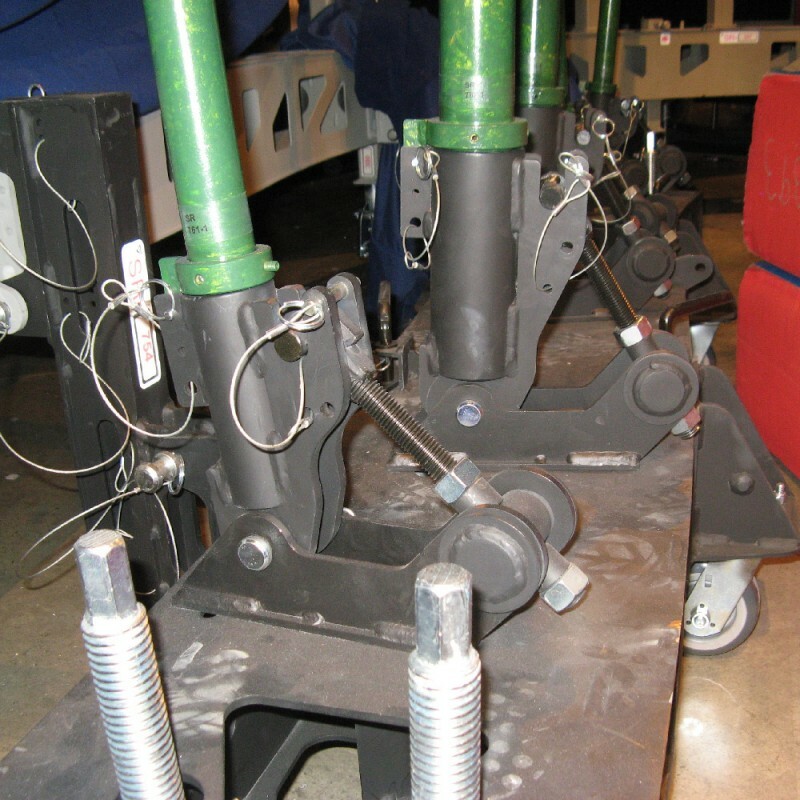 To allow the performers to manually move an imposing 7,000 lb bowl of water towards the centre of the turntable so that they could perform their acts, we designed rolling tracks that would be safe and easy to use. We also created retractable stairs that provided the performers with access to the stage. The Canopy, a forest made up of steel and aluminum tubes, presented several challenges: the branches had to support their own weight while meeting the structural standards and timeline imposed by the Cirque. As a result, the branches were designed in 3 to 6 sections that could be pieced together using mechanical seals developed especially for this production. The system also solved the issue of transport constraints. 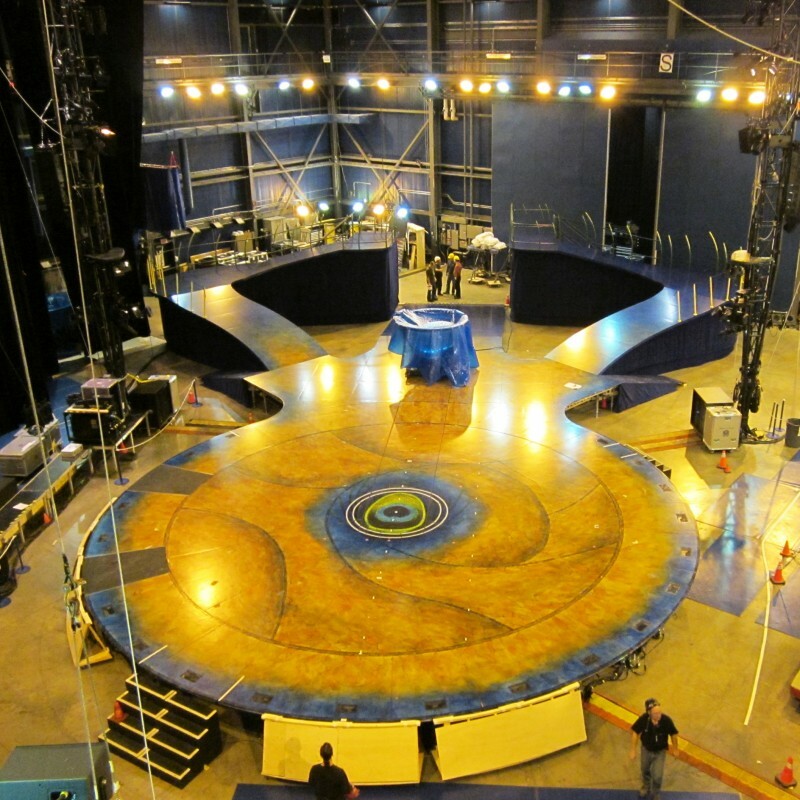 Stage set up in the Cirque’s studio. Canopy supports and pivot bases.